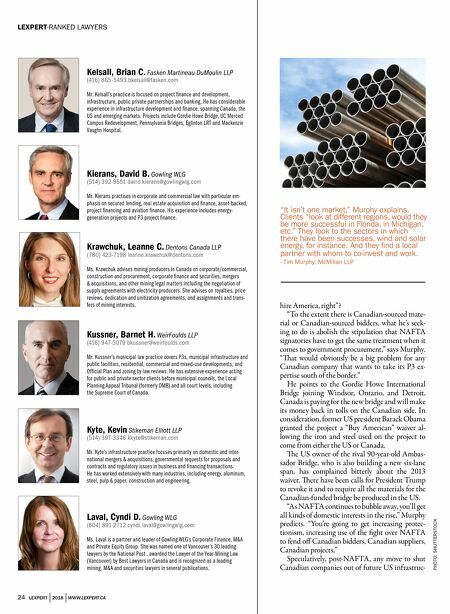 WWW.LEXPERT.CA | 2018 | LEXPERT 25 Lewis, QC, Gregory D. Norton Rose Fulbright Canada LLP (604) 641-4923 greg.lewis@nortonrosefulbright.com Mr. Lewis is the Canadian Head of the firm's Infrastructure group. His practice focuses on commercial transactions in infrastructure, energy and other indus- try sectors. His experience includes PPPs in a variety of sectors, as well as port developments, hydro and co-generation projects. Levy, Serge Stikeman Elliott LLP (514) 397-3194 sergelevy@stikeman.com Mr. Levy's practice is focused on banking law, corporate finance, financial services and commercial law. He is involved in sophisticated infrastructure debt financing transactions representing corporate borrowers and financial institutions alike. He regularly acts on mining, project, PPP, restructuring, real estate, and leveraged buyout transactions. 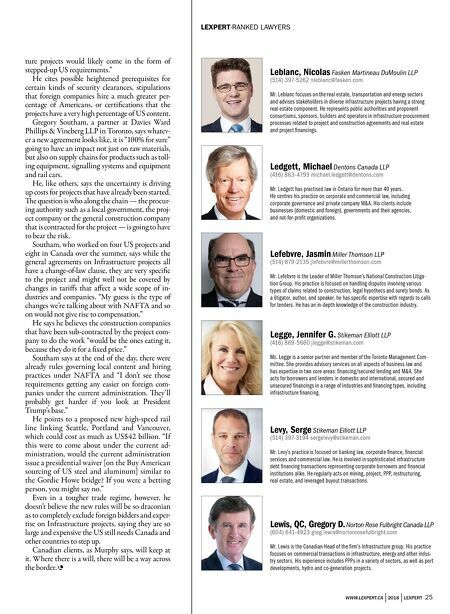 Legge, Jennifer G. Stikeman Elliott LLP (416) 869-5660 jlegge@stikeman.com Ms. Legge is a senior partner and member of the Toronto Management Com- mittee. She provides advisory services on all aspects of business law and has expertise in two core areas: financing/secured lending and M&A. She acts for borrowers and lenders in domestic and international, secured and unsecured financings in a range of industries and financing types, including infrastructure financing. Lefebvre, Jasmin Miller Thomson LLP (514) 879-2135 jlefebvre@millerthomson.com Mr. Lefebvre is the Leader of Miller Thomson's National Construction Litiga- tion Group. His practice is focused on handling disputes involving various types of claims related to construction, legal hypothecs and surety bonds. As a litigator, author, and speaker, he has specific expertise with regards to calls for tenders. He has an in-depth knowledge of the construction industry. Ledgett, Michael Dentons Canada LLP (416) 863-4793 michael.ledgett@dentons.com Mr. Ledgett has practised law in Ontario for more than 40 years. He centres his practice on corporate and commercial law, including corporate governance and private company M&A. His clients include businesses (domestic and foreign), governments and their agencies, and not-for-profit organizations. Leblanc, Nicolas Fasken Martineau DuMoulin LLP (514) 397-5262 nleblanc@fasken.com Mr. Leblanc focuses on the real estate, transportation and energy sectors and advises stakeholders in diverse infrastructure projects having a strong real estate component. He represents public authorities and proponent consortiums, sponsors, builders and operators in infrastructure procurement processes related to project and construction agreements and real estate and project financings. LEXPERT-RANKED LAWYERS ture projects would likely come in the form of stepped-up US requirements." He cites possible heightened prerequisites for certain kinds of security clearances, stipulations that foreign companies hire a much greater per- centage of Americans, or certifications that the projects have a very high percentage of US content. Gregory Southam, a partner at Davies Ward Phillips & Vineberg LLP in Toronto, says whatev- er a new agreement looks like, it is "100% for sure" going to have an impact not just on raw materials, but also on supply chains for products such as toll- ing equipment, signalling systems and equipment and rail cars. He, like others, says the uncertainty is driving up costs for projects that have already been started. e question is who along the chain — the procur- ing authority such as a local government, the proj- ect company or the general construction company that is contracted for the project — is going to have to bear the risk. Southam, who worked on four US projects and eight in Canada over the summer, says while the general agreements on Infrastructure projects all have a change-of-law clause, they are very specific to the project and might well not be covered by changes in tariffs that affect a wide scope of in- dustries and companies. "My guess is the type of changes we're talking about with NAFTA and so on would not give rise to compensation." He says he believes the construction companies that have been sub-contracted by the project com- pany to do the work "would be the ones eating it, because they do it for a fixed price." Southam says at the end of the day, there were already rules governing local content and hiring practices under NAFTA and "I don't see those requirements getting any easier on foreign com- panies under the current administration. ey'll probably get harder if you look at President Trump's base." He points to a proposed new high-speed rail line linking Seattle, Portland and Vancouver, which could cost as much as US$42 billion. "If this were to come about under the current ad- ministration, would the current administration issue a presidential waiver [on the Buy American sourcing of US steel and aluminum] similar to the Gordie Howe bridge? If you were a betting person, you might say no." Even in a tougher trade regime, however, he doesn't believe the new rules will be so draconian as to completely exclude foreign bidders and exper- tise on Infrastructure projects, saying they are so large and expensive the US still needs Canada and other countries to step up. Canadian clients, as Murphy says, will keep at it. Where there is a will, there will be a way across the border.